Announces far-reaching architectural changes for its cloud contact center service as part of summer software release. Last year, writing about Five9's Summer Release 2016, I said "the era of cloud leapfrogging customer-premises applications may have just begun." At the time, Five9 had announced the integration of Altocloud customer journey analytics into its cloud contact center solution. Back now with its Summer Release 2017, Five9 is continuing that story -- delivering not only expected feature enhancements but also far-reaching architectural changes. Five9 has grouped the changes this release brings to the Virtual Contact Center (VCC) application into four major themes: enterprise, global, end-to-end solution, and continuous improvement. Like other SaaS companies, Five9 built its initial contact center-as-a-service (CCaaS) offering, about 15 years ago, as a single -- what would now be called monolithic -- multitenant application, VCC. Building on efforts that began two years ago with the Freedom Release, Five9 continues to move from a core application architecture to a more modern, microservices-based one in this latest release. The Summer Release 2017 modularizes voice, email, chat, social, voice recording, answering machine detection, speech recognition, and customer journey analytics applications. This will allow Five9 to scale up and down the resources required for each function independently based on demand. Essentially, it has largely decomposed into a series of application services. From my perspective, a key element of this release's global attributes is that enabled by the deployment of a Five9-built, carrier-grade softswitch connected to new voice points of presence (PoPs) around the globe. "The Class 5 softswitch provides us the scalability to move from supporting hundreds of agents to now thousands of agents, and really move upmarket to support large enterprises," Giorgio Mihaila, Five9's director of product management, described during a briefing. As seen in the figure below, Five9 continues to deliver the VCC application from four private data center locations it manages in the U.S. and Europe. 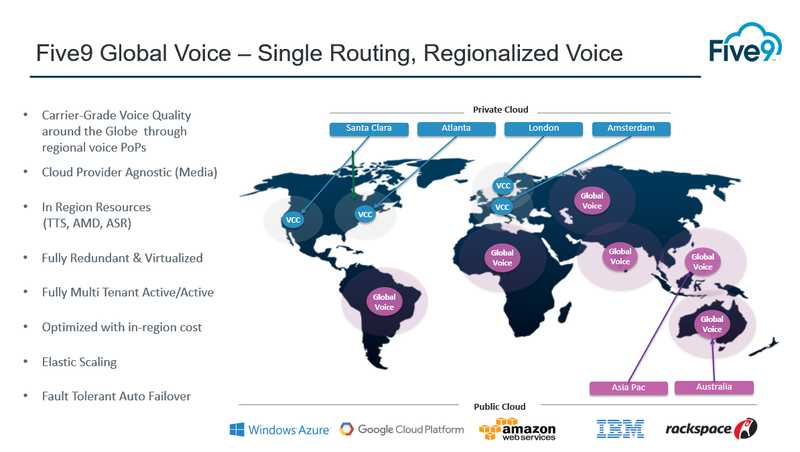 It has deployed regional voice PoPs via public cloud infrastructure, initially using Amazon Web Services (AWS) but portable in the future to the other public cloud platforms pictured in the graphic. Five9 has deployed the Asian market PoPs, as shown, while making those in South America, Africa, and the Middle East available opportunistically via quick ramp-up in AWS regions. Five9 competes with CCaaS and premises-based contact center vendors that arguably have more components of an end-to-end customer care solution. Notably, for example, Five9 doesn't have an integrated workforce optimization (WFO) suite. But, as part of this release, it now offers tight integration between VCC and WFO solutions from partners Calabrio and Verint, achieved through joint development. In addition, Five9 and Salesforce have worked to integrate the Five9 agent desktop into the Salesforce Lightning console, said Gaurav Passi, EVP of products and technology at Five9. And, this release offers integration with Microsoft's Skype for Business unified communications platform, either through the standard Five9 desktop or with Salesforce Lightning. As is true with most new software, Five9 describes the Summer Release 2017 as including more than 100 key features and enhancements that meet customer needs. Both the content and the marketing messages around this release signal Five9's intention to make its mark in the large enterprise contact center market. Unlike the oft-quoted phrase from the movie "Field of Dreams" -- build it and they will come -- Five9 has built this release around the needs of existing customers looking to the company to help them unify their global customer care efforts. At the same time, these architectural and voice features will allow Five9 to attract new customers that may have been unwilling to move to the cloud without them.